Steeped in history and oozing chocolate-box charm, Estonia’s capital city is all turrets, steeples and enchanting cobbled medieval streets. 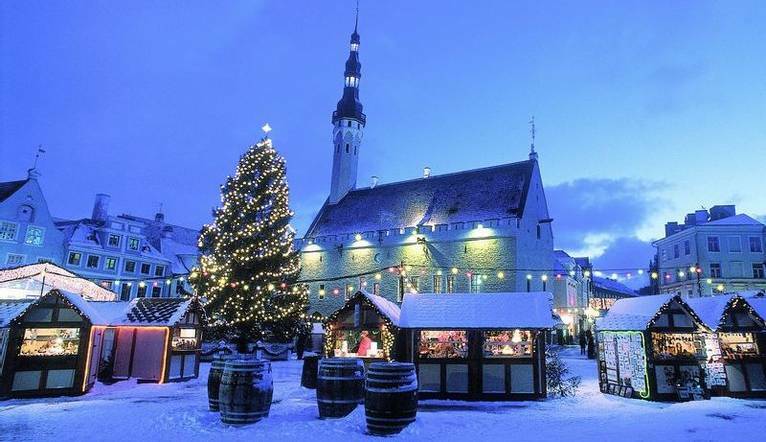 Particularly pretty at Christmas time, Tallinn is perfect for a festive city break. Look no further than this wonderful city for a fascinating weekend away. Since opening its doors to tourism in 1991, Tallinn has miraculously managed to preserve its thousand-year old beauty. Our tour takes us through the gorgeous Kadriorg Park, Song Festival Grounds and the seaside district of Pirita, before leading us through the UENSCO-listed Tallinn Old Town. From Toompea and Komandandi Street we will cross Toompea Hill, the ancient city centre at the tower of Tall Hermann. Afterwards we can proceed to the Palace of Toompea that houses the Parliament Riigikogu, to Aleksander Nevskij Cathedral and the Dome Church. On the way to the lower town, we can enjoy the picture-perfect view over the medieval Old Town from a viewing platform before descending to the lower town. New modern buildings contrast beautifully with old medieval architecture and culture, history and tradition are apparent in everything we experience here. During our time at leisure we can stroll through the winding streets or simply sit in a street side café and watch the world go by. Being just 80km from Tallinn, this trip also includes a day tour to discover the neighbouring capital of Finland. Our ferry takes about 2 hours and we include return ferry tickets, a Helsinki Tourist Card and an audio guided tour of this vibrant city. Here will see the most interesting parts of Helsinki, such as the historical centre, the Presidential Palace, City Hall, the Parliament buildings, Finlandia Hall and the Opera House. The rest of the day is at our leisure to explore on our own before catching the return ferry back to Tallinn. Our chic hotel is set in a Victorian style building just a 10 minute walk from the Old Town. Facilities include a restaurant, bar, lift, terrace, gift shop, massage room (extra charge) and sun terrace. Our comfortable rooms all come with under floor heating in the bathrooms, safe, flat-screen TV, minibar, hairdryer and complimentary Wi-Fi. The transfer time from Tallinn Airport to the hotel is approximately 15 minutes depending on traffic. During your holiday, we have included a guided tour of the the city as well as full day in Helsinki, th capital of Finland.